This image came together by chance and the possibility of ever repeating anything similar is very small. I absolutely envy gyaban of being able to have a vision, then shoot for it and then put it all together to meet his vision. 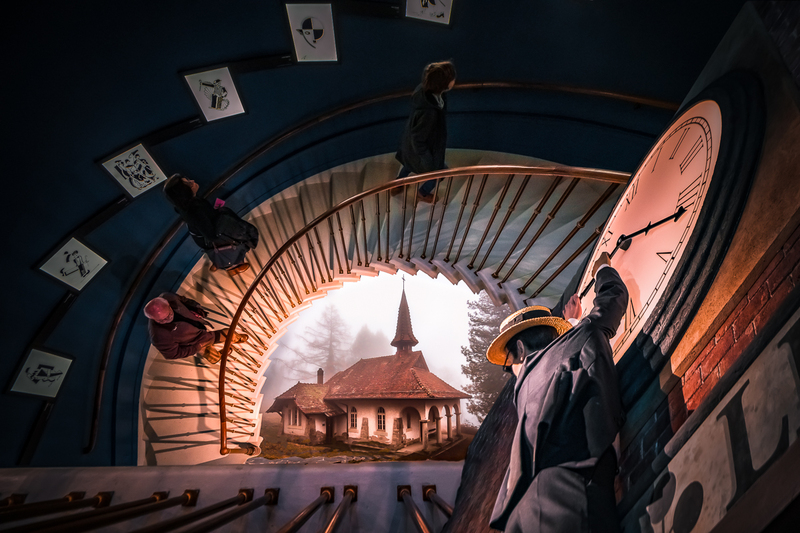 I started with one image I really wanted to use (Buster Keaton hanging off the clock from Chaplin's World), then found the staircase image that I liked because of the way these 3 people were spaced, and then realized that if I put the image of the little church in the fog in the centre it might all come together. So pure chance, no vision. and to quote you "This image came together by chance and the possibility of ever repeating anything similar is very small. " ..
pure chance is the best .. and we all come at a 'creation' differently ..
altho i also envy gyaban for his vision and his amazing skills ..
i think this is absolutely EPIC .. what a wonderful image you have made ..
and its insane .. that you said at the beginning of the march side challenge that your photoshop skills needed a lot practice ..
Margaret, this is wonderful! Congrats on the red. Brilliant! Margaret, you're one very talented lady. Congrats. This is wonderfully put together Margaret. Congrats. Way to go, Margaret! Congrats. One of your best works Margaret this is so brilliant, congratulations on your ribbon. Love how you put this together, top stuff! Wow! This should do well. Very well done indeed, I absolutely love this! Proudly hosted by Sargasso Networks. Current Server Time: 04/20/2019 02:16:52 PM EDT.